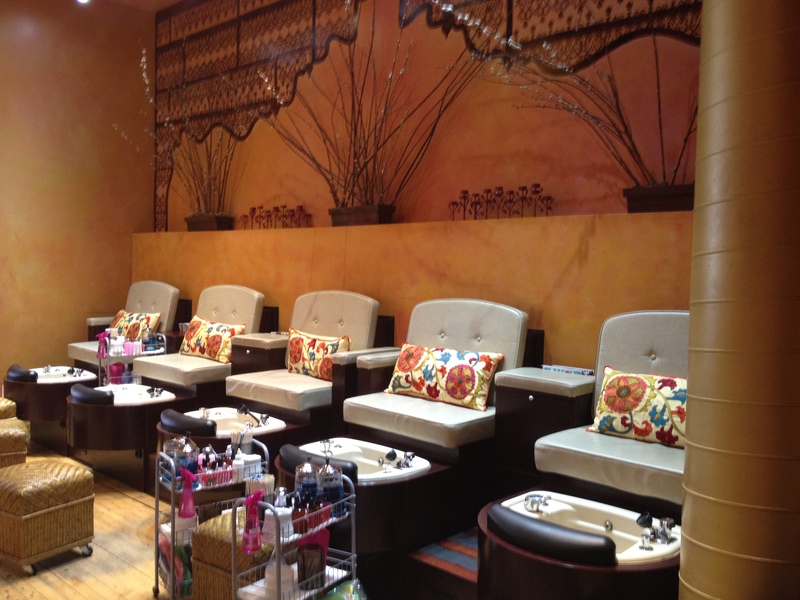 Get pampered from head-to-toe at Mojo Spa, located at 1468 N. Milwaukee Ave. Last Tuesday, I happened to walk in for a much needed pedicure. (Tip: Call the shop to see if they have any spa specials. Mojo offered a FREE mani with pedi the day I went!). 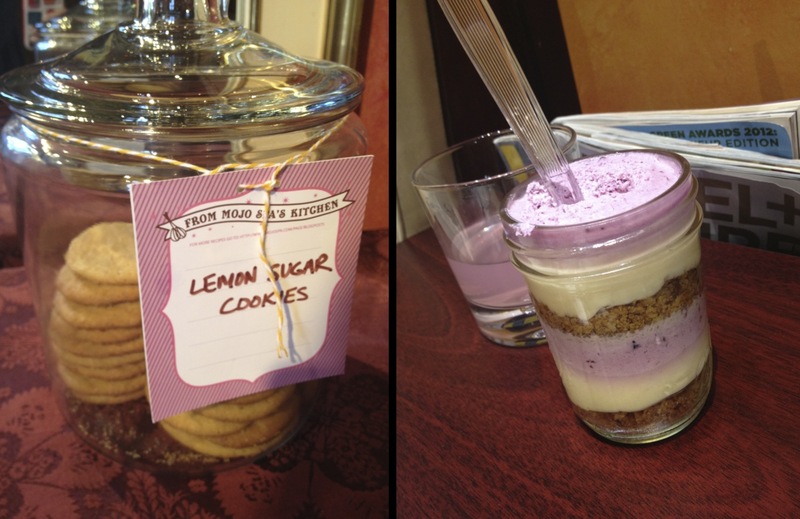 I’ve been to Mojo twice before and I simply love its business model – spa, boutique, and bakery all rolled into one! Owner and innovator Amanda Kezios was a personal chef before opening Mojo Spa. 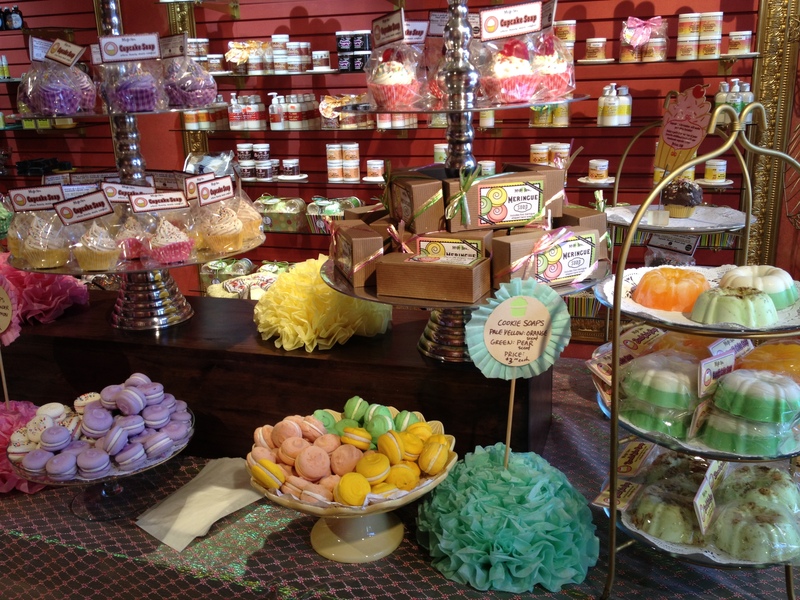 She relayed her love of cooking with fresh, natural ingredients to creating handmade beauty products. Though Amanda is running a successful beauty business, she hasn’t parted from her culinary background. You’ll notice most of the products sold at the store are made to look like baked goods or sound like a food recipe. For instance, my fabulous manicurist Anna used Mojo’s Sinful Strawberry Face & Body Scrub (pretty sure I spotted some seeds in it) to exfoliate my worn feet. If your hands and feet are already perfectly polished, go window shopping! Amanda makes awesome accessories in addition to amazing beauty products. She crafts jewelry, knitwear, and handbags in her spare time. Is there anything this woman can’t do? My favorite Mojo accessory is the clutch with agate stone. It’s a beautiful handcrafted bag with smart compartments – take a peek at the photo below. (Tip: If you can’t find what you’re looking for at the store, visit the Mojo Spa Style page on Etsy!). Schedule an appointment at Mojo Spa today! There’s nothing artificial about it! Mojo is open on select Mondays, Tuesday through Friday from 12:00 p.m. – 8:00 p.m., Saturday from 10:00 a.m. – 8:00 p.m., and Sunday from 10:00 a.m. – 6:00 p.m. (Tip: Attend Pajama Nights on the first Friday of select months for makeovers, facials, and desserts!). Need to perk up after a relaxing day at the spa? Then walk next door to Wormhole Coffee. Get a side of 80s nostalgia with your Vanilla Bean Latte or Peanut Butter Koopa Troopa. You can’t miss the DeLorean à la “Back to the Future” inside Wormhole! Have a “High Fidelity” moment just around the corner at Double Door (1572 N. Milwaukee Ave.). Double Door is a music venue and Chicago institution. Just look at the pictures of legendary performers plastered along its walls! It’s the rockin’ party you always wanted to throw in your parents’ basement – listen to live music, order a drink special from the massive bar, have fun in the photo booth, or hold an impromptu ping pong tournament. Join Tip C in celebrating the 6 Year Anniversary of Frasca on Tuesday, May 15, from 4:30 p.m. – 10:00 p.m.
$6 Margherita Pizzas and $6 Glasses of Wine at Frasca! In honor of turning 6, they’ll be serving $6 Margherita pizzas and $6 glasses of wine. A deal you can’t afford to miss! Hope to see you at the party!!! Yes, Tip C is finally getting tipsy (or at least slightly buzzed). Last Saturday, I scheduled a tour with some friends at Koval Distillery, located at 5121 N. Ravenswood Ave. (Tip: Don’t forget to bring your driver’s license or state ID to prove you’re of drinking age. Otherwise, staff won’t allow you into the facility!). 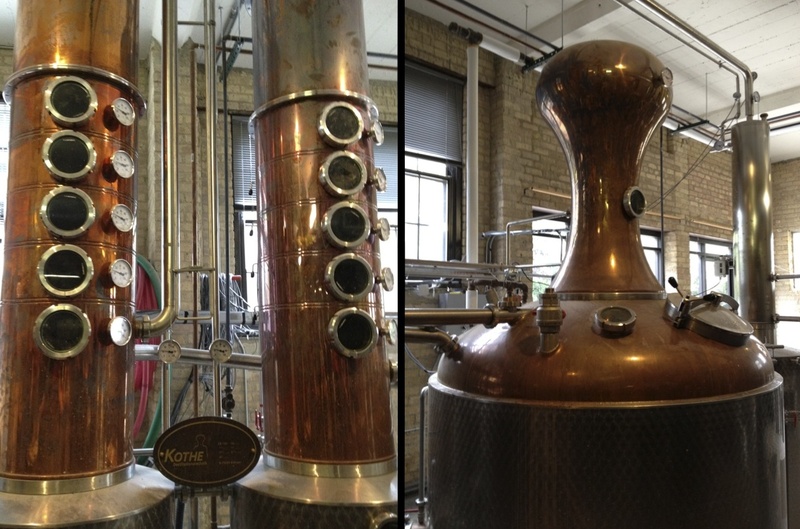 Koval is a family-operated, craft distillery founded by Robert and Sonat Birnecker. Robert brought his family’s distilling techniques from Austria and continued the tradition in our fair city. Koval’s business model is the first of its kind in Chicago since Prohibition. And now, we get the privilege to sample its whiskey without breaking the law. Koval Office Manager Jason Liechty led our tour. Jason guided us through the distillery’s history, whiskey-making process, and Koval product line. (Tip: Be sure to wear comfy shoes! It’s a 1 ½ to 2 hour tour of the distillery, which can be harsh on the feet.). And of course there were tastings of Koval spirits. However, don’t expect to get drunk unless you’re a total lightweight. Jason informed us that alcohol producers are only allowed to serve each patron up to 2 ounces of liquor during tours. Needless to say, we were given small servings of the 9 spirits we tasted – 3 from the White Whiskey line, 3 from the Lion’s Pride Whiskey line, and 3 liqueurs. Koval has 30 spirits, so it was nice that they offered us a good portion of their products. 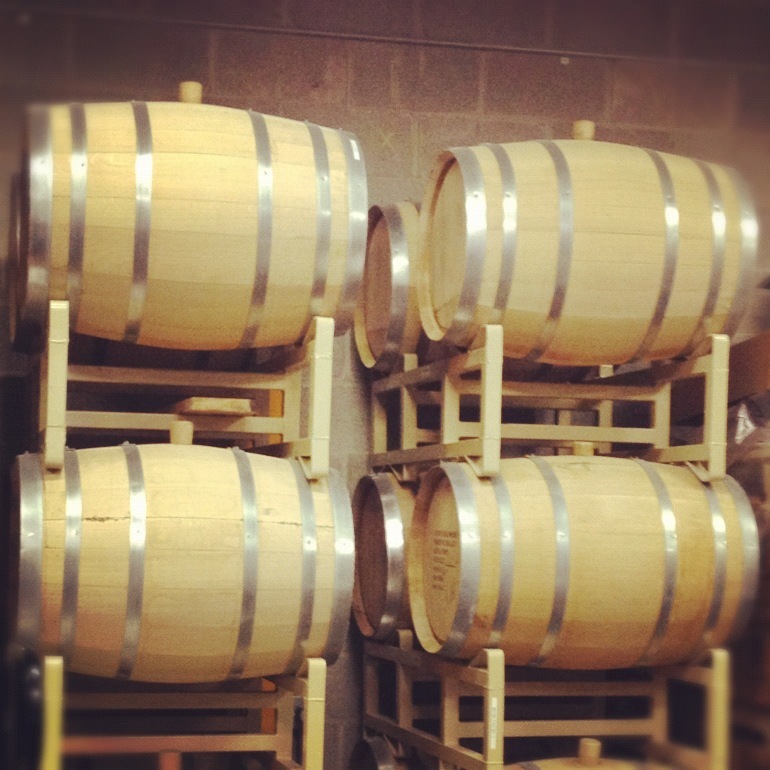 Koval makes a pure artisan product – single barrel whiskey made from rye, wheat, oat, millet, or spelt. Jason handed us jars of each ingredient in its purest form, which is why Koval is certified organic and kosher. Aside from whiskey, Koval creates truly unique liqueurs and specialty spirits. For instance, Koval used Metropolitan Brewery’s Dynamo Copper Lager to concoct Bierbrand, a German beer schnapps. Koval also has limited edition spirits, such as its Paw Paw Liqueur and Asian Pear Liqueur. (Tip: Pick up those limited edition liqueurs in case Koval doesn’t produce them again. It may be your last chance!). At the end of the tour, you can purchase any Koval spirit, as well as t-shirts, glassware, and much more. (Tip: Sign up for Koval’s newsletter and volunteer list. Volunteers at Koval receive a discount on products!). Tours take place every Wednesday at 7:00 p.m.; Saturday at 1:00 p.m., 3:00 p.m., and 5:00 p.m.; and Sunday at 7:00 p.m. (Tip: Buy a Drink Deck before scheduling. You get a complimentary tour of Koval for two and 15% off in-distillery purchase!). 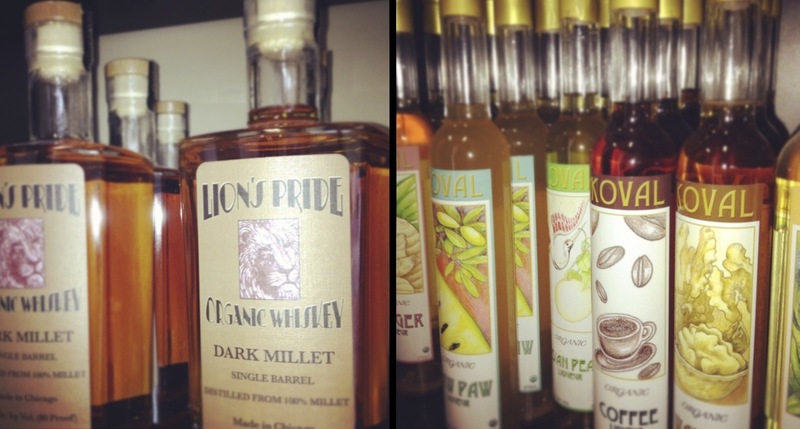 Be a locavore and sip some Koval whiskey soon…cheers! Interested in brewery tours? Then schedule one with Metropolitan Brewery (Koval’s next door neighbor). 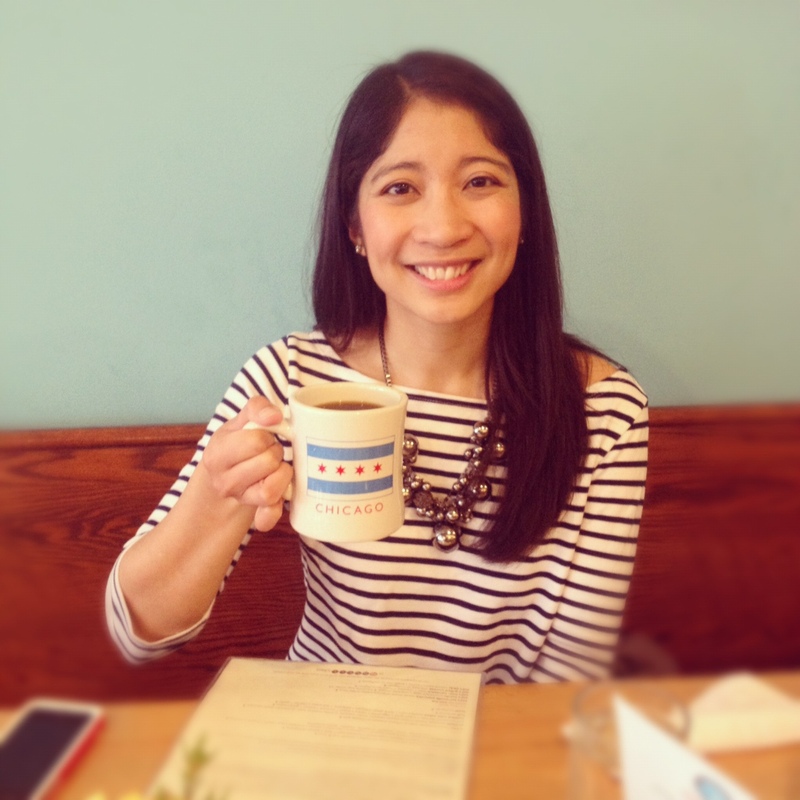 Like Koval, Metropolitan is a Chicago brand with an emphasis on quality. Tours with Metropolitan are few and far between, but don’t be discouraged. Metropolitan beer is sold and served at various stores, restaurants and bars in Chicago. Feel like a kid again at WhirlyBall, located at 1880 W. Fullerton Ave. WhirlyBall is a game of bumper cars meets lacrosse meets basketball. It sounds complicated, but trust me, you’ll have so much fun playing it! And I warn you, amidst the excitement you will get bruised! (Tip: Buy a tube of Arnica Cream at your local drug store or health foods store before you play. It helps heal bruises and sore muscles after an intense WhirlyBall match!). There are 10 WhirlyBall cars per court – five cars for Team Black and five cars for Team Red. Although there are 10 cars available for your party, you are allowed 6-10 players on the court at a time. If you happen to have a larger party (i.e., more than 10 players), you can alternate players between matches. This video was produced by the WhirlyBall folks. It shows a little footage of the game and highlights the facility as a place to hold a special event. Rates vary depending on the amount of players in your party and number of hours you intend to play. Click here for hourly rates. (Tip: If you’re on a tight budget, arrange to have more than 10 players. You may have a little less play-time, but it reduces the cost!). Also, if you need a break from WhirlyBall there’s a bar, pool table, foosball table, and plenty of arcade games to keep you occupied. 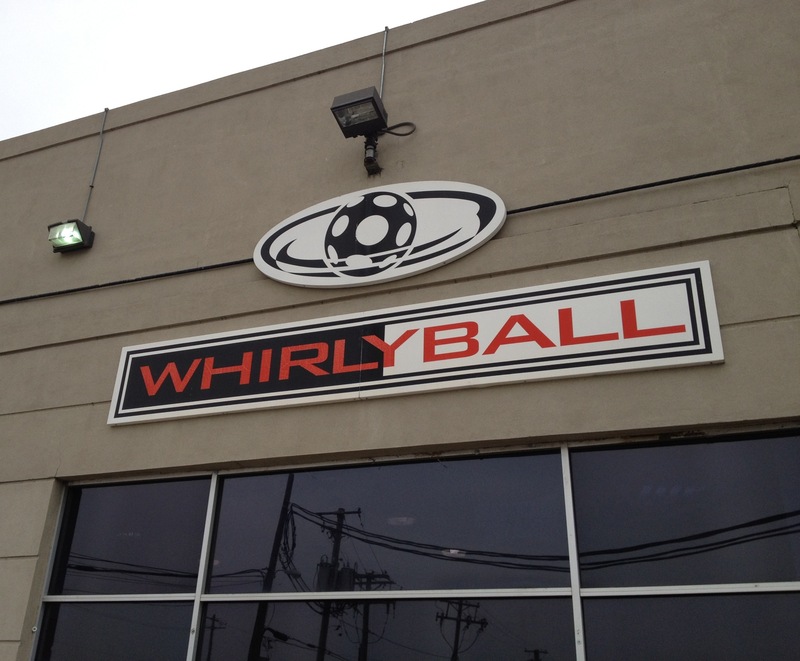 Hope to see you on the WhirlyBall court soon! 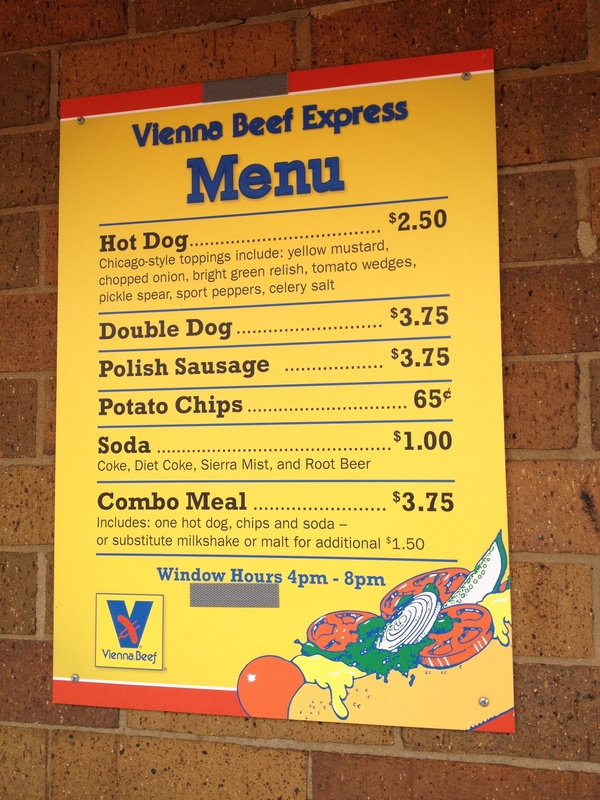 You tend to work up a hunger after WhirlyBall, so walk down the street to the Vienna Beef Factory at the intersection of Damen Ave. and Fullerton Ave. Vienna Beef is one of the most recognizable brands in Chicago because its 100% premium beef hotdogs are used in the classic Chicago hotdog. And, you can buy a Chicago hotdog at the factory for less than $3 dollars. In fact, all the food at the express window and inside the factory’s deli is reasonably priced. If you’d rather eat at home, pick up a pack of Apple & Havarti Chicken Sausages or an Italian Beef Kit from the Vienna Beef Store for a delicious dinner. Vienna Beef also conducts tours, but according to the website tours are booked through Winter 2014 (yikes). In the off chance that they can squeeze you into a tour, visit Tour Vienna Beef.